Life all alone on the road is fun and exciting. You don’t know what’s next and you get to make all the decisions yourself. The opportunity to travel solo may not always be there, so when it does present itself, you should definitely take it. Particularly if Bangalore is your starting point, you have plenty of options. You can go to the wonderful nearby city of Mysore or head out to the picturesque hills of Ooty. It’s your choice! Here are the top 15 destinations from Bangalore for the solo traveler. If you are a solo traveler looking to take a unique trip on the weekend, visiting a vineyard is quite a cool choice. Just off Bangalore’s city limits lies the Grover Vineyards in the famous Nandi Hills. Here, you can go for a vineyard tour and learn how wine is made. You can also book a wine tasting session at a fairly reasonable price. Distance from Bangalore: The vineyards are located about 45 kms from Bangalore. Best Time to Visit: Any time of the year, though it can be pretty hot in the summer. Channapatna is a town well known for its wooden toys and bangles. For solo travelers who love exploring offbeat places, this one should be on top of their travel list. At Channapatna, you can get a first-hand experience of how wooden toys are made by visiting one of the many toy factories. You can also buy traditional Indian toys and bangles at reasonable prices. Distance from Bangalore: Channapatna is just a 60-kilometer drive from Bangalore. Located in Andhra Pradesh, this place is blessed with resplendent temples whose architecture resemble those found in Hampi. It is best to drive down to Lepakshi from Bangalore, but if one wants to use public transport, you can hail a bus to Hindupur and from there board an auto rickshaw or taxi. If you love shopping for traditional Indian attire, there are a few famous shops here that sell beautiful sarees. Distance from Bangalore: Lepakshi is just a 125-kilometre drive from Bangalore. Best time to Visit: The best time to visit is from November to February, when the weather is cool. Mysore is a great place for solo travellers who love architecture. A visit to the acclaimed Mysore Palace is a must for any tourist visiting the city of Mysore. If you get bored of exploring all the historic sites here, you can opt to go shopping in Mysore. Mysore has plenty of local stores that sell sandalwood products and silk clothing. The Devaraja Market on Sayyaji Rao Road is a famous shopping market to buy local goods in Mysore. And, if you are into health and fitness, there are plenty of yoga and Ayurveda centres in the city of Mysore that sell traditional Ayurvedic medicine. Best time to Visit: It’s such a short ride away, you could visit all year round. If you are a solo traveller looking to explore nature and indulge in some adventure sports, there’s no better place for you to travel to than Coorg. From trekking up to the waterfalls to river rafting, Coorg has a lot of things for you to do and explore. 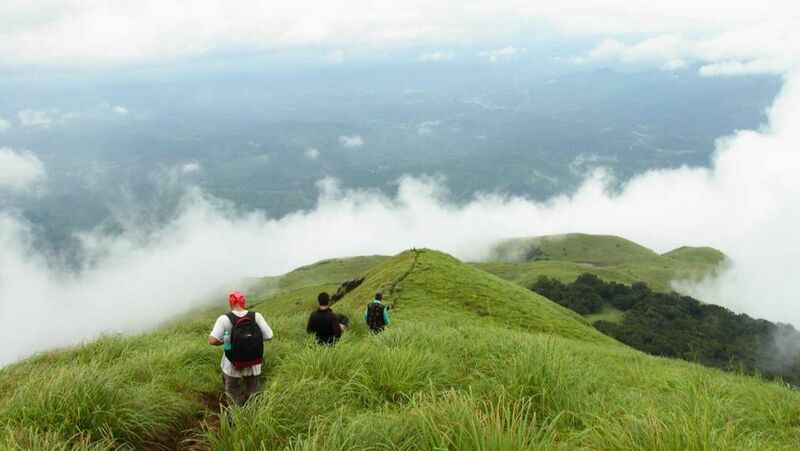 In Coorg, you’ll find a couple of mountains that are ideal for trekking. One such place is Kotebetta. This hill offers splendid views of coffee plantations from high-up and is filled with natural beauty. If you go here on the weekends, you will find other trekkers who come to make the climb up to the mountain. Besides trekking, another adventure sport that one can undertake in Coorg is white water rafting on the Kaveri river. The cost for rafting here depends on the level of the course you pick. Prices start at Rs. 600 and go up to Rs. 1000. Best time to Visit: With a lovely climate all year long, there is no one time that’s best to visit Coorg. Another great spot for solo travelers who love natural beauty, Ooty could remind you of the English countryside. For the real experience, head a little away from the main city centre. That’s where you’ll find beautiful tall pine trees and lovely green foliage. For a memorable experience in Ooty, take a ride on the cozy mini train that takes you through beautiful and stunning scenery that you will normally only see in movies. Distance from Bangalore: Around 280 kilometres from Bangalore. Best time to Visit: The best time to visit Ooty is during the months of April to June, but, if you love the cold weather, head over between November and February. For the solo traveler looking to tour the outdoors, Wayanad is the ideal destination for a short break. There’s plenty of outdoorsy stuff that one can enjoy in the land called the ‘Green Paradise’. One can enjoy treks at the Chembara Peak, go cave exploring at Edakkal or just chill in nature’s lap at the Banasura Dam. Solo travelers who love photography must visit the Sulthan Bathery to get amazing shots of the sparkling streams and the caves. Distance from Bangalore: Wayanad is located about 285 kilometres away from Bangalore. Best Time to Visit: To experience the cool weather of Wayanad, head to the hill station during the months of October to January. Ideal for solo getaways, Chikmagalur presents solo travelers with plenty of things to do and explore. The town provides you with the chance to go trekking at the Hebbe Waterfalls, enjoy white-water rafting on the Bhadra River, and even take walks in one of the many coffee plantations. If ancient Indian architecture is something you love, there are a few pilgrimage sites that are ideal for exploring. Those who love wildlife safaris can visit the Bhadra Wildlife Sanctuary. There are jeep tours conducted here that cost around a thousand rupees per person. The safari is held daily at 6 am and at 4 pm. Distance from Bangalore: Around 290 kilometres from Bangalore. Best time to Visit: The weather is best during the months of September to March. Kotagiri is blessed with scenic hills that are ideal for single travelers who love exploring the mountains. Although there are plenty of trekking opportunities here, what one must really explore in Kotagiri are the tea plantations. There are beautiful tea plantations on the way to the Catherine Falls that are a great place to visit. After touring the tea plantations, head to the Kodanad viewpoint that offers a panoramic view of Kotagiri. This vantage point is a great spot to click amazing photographs. Distance from Bangalore: Around 310 kilometres away from Bangalore. Best time to Visit: Head over in the summertime, to get away from the Bangalore heat. Rooted in history, Hampi in Karnataka is one destination that solo travelers who love history and architecture will love visiting. Add to your knowledge of India’s early civilizations at the ruins of the Vijayanagara Kingdom in Hampi. If you aren’t comfortable walking around, you can hire a cycle and ride along the calm and cozy roads in Hampi and gaze at the beautiful surroundings and the forgotten empires that now remain in ruins. The atmosphere in Hampi is lovely, calm, and less chaotic, so it is the perfect place to go to if you’re looking to take a break from the fast paced city life. Some important attractions in Hampi that one shouldn’t miss out on are the Vittala Temple, the Zenana Enclosure, and the Queen’s Bath and Royal Centre. Often called the Kashmir of South India, Munnar is a great place for the solo traveller who loves to bask in nature’s beautiful landscapes. Munnar is blessed with one of the most picturesque surroundings that you can ever find in South India. On arriving in Munnar, you may wonder if you’ve actually been transported abroad. Trekking, cycling and rock climbing are some of the outdoor activities that you can do in Munnar. Besides being a beautiful place to take a solo trip, Munnar is very safe, so getting around shouldn’t be stressful. Best time to Visit: All around the year, as the weather is always wonderful this high above sea level. Also a pilgrimage site, Gokarna is the perfect getaway destination if you love the beach, but not the crowds of Goa. When compared to the beaches in Goa, the beaches here are less noisy, with less commercial activity, and are great for relaxing. Distance from Bangalore: Gokarna is 500 kilometres away from Bangalore. Best Time to Visit: To truly experience Gokarna, go here during the months of October to April when the climate is pleasant. There’s no better place for a solo trip than a getaway to Goa. Despite all that you’ve heard and read about the land of sunshine and palm trees being only apt for romantic getaways, Goa has plenty of options for solo travelers. Besides surfing, parasailing, windsurfing, and water-skiing, one can relax at one of the many famous beaches in Goa. Patnem, Agonda, Morjim, Sernabatim and Ashwem are some of the quieter beaches. Distance from Bangalore: Goa is located about 550 kilometres away from Bangalore. Best Time to Visit: In the months of November to March, when its peak season and you’re sure to make some friends. Situated in the South of India, Alleppey is a famous tourist destination in Kerala. Perfect for solo travelers who are looking to just get away from the noise and hustle of the city life, the sleepy town is just right for a quiet and peaceful getaway. The beach here is calm and lacks the buzzing atmosphere of a beach in Goa or any other beach town. It’s the perfect place to just unwind, relax, and spend some quality time alone. One can also enjoy a lazy boat cruise on the backwaters of Alleppey. You may want to note that boat cruises only take place during the day and in the early evening. Distance from Bangalore: Around 590 kilometres away from Bangalore. Best time to Visit: The winters (November to February) are the perfect months to visit Alleppey. Solo trips are a wonderful way to regain that zest for life. So, the next time you’re planning on taking a solo trip from Bangalore, make sure you jet off to the places we’ve mentioned. Once you’re there, tell us about your experience. We would love to hear from you in the comments section below. 16 Dance Clubs in Bangalore to Bop the Night Away!